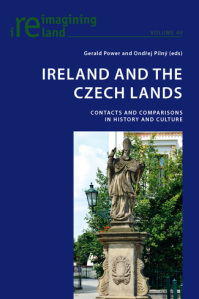 On 13 December 2013 MUP with the Embassy of Ireland, Prague, hosted a reception to mark the publication of Gerald Power and Ondřej Pilný (eds), Ireland and the Czech Lands: Contacts and Comparisons in History and Culture (Bern: Peter Lang). The event was held at the literary cafe Krásný ztráty, and was attended by students, colleagues and friends, as well as special guests the Irish Ambassador, Ms. Alison Kelly, and the Rector of the University, Prof. Michal Klíma. Highlights of the evening included the ‘Sokol poem’ (verse inspired by the brief enthusiasm for Sokol exercises in Ireland in the 1930s) read by doc. Pilný, and a superb performance of Irish-Czech music by the band Conemara Chaos.